The virtual parade video is available on YouTube 360 (desktop), the YouTube app (mobile) and via Google Cardboard (also mobile). #UnitedWeMarch is part of the Google Impact Challenge: Disabilities, which has given $20M in grants from Google.org toward organizations improving the lives of people with disabilities. 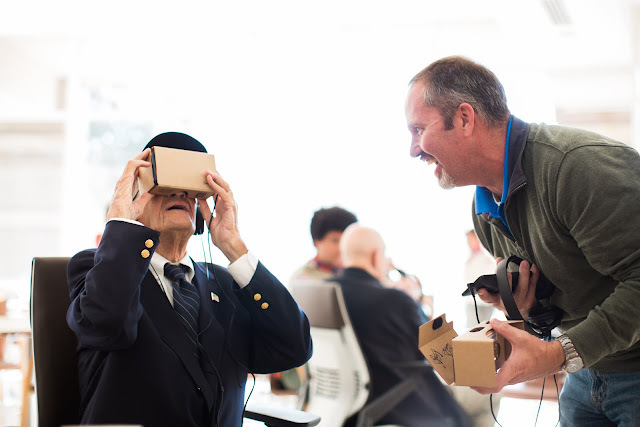 In honor of disabled veterans, Google.org also gave a $235,000 grant to America Makes to create a training for military veterans to learn the basics of using new technologies to build personalized assistive devices like 3D-printed prosthetic limbs. This is all in collaboration with the Department of Veterans Affairs Center for Innovation. I’m so grateful to have been there yesterday, seeing the veterans temporarily escape their hospital beds through virtual reality and experience the crowds cheering them along the parade route. We’ll continue these virtual marches tomorrow and into next week, so that every veteran has the chance to be celebrated.